Energy efficiency is a goldmine, but not everyone has the time or resources to dig. That’s why for the past seven years, over three hundred organizations have turned to EDF Climate Corps for hands-on help to cut costs and carbon pollution through better energy management. And every year, the program delivers results: this year’s class of fellows found $130 million in potential energy savings across 102 organizations. But this year we also saw something new. 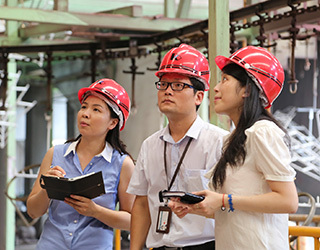 In addition to mining efficiencies in companies’ internal operations, the fellows were sent farther afield – to suppliers’ factories, distribution systems and franchisee networks. What they discovered demonstrated that there is plenty of gold to be found across entire value chains, if companies take the time to mine it. What happens when existing green building certification and recognition systems, such as LEED or Energy Star, do not meet your building needs? The only answer for many major corporations is: create your own building standards. As a 2010 EDF Climate Corps fellow, my mission this summer was to create the business case for Cummins’ Global Building Policy, while reducing the company’s environmental impact. Cummins has made a voluntary commitment to reducing GHG emissions through the EPA’s Climate Leaders program. With energy efficiency teams already in place at many Cummins facilities, my job was to incorporate these efforts by creating building standards for future building projects. How do you create a standard for such a wide variety of building types and locations? When does a standard become too specific? Or too general? With so many stakeholders involved, who exactly is the audience? How do I best present a business case for such a broad program? How do we synthesize so many opinions and so much knowledge? The process of creating a building requires careful collaboration of many minds, especially in a highly technical, manufacturing environment. Getting input and reaching agreements between executive leadership, functional experts, design professionals and end-users takes time and finesse. Additionally, between all those stakeholders there is a vast amount of knowledge that if leveraged correctly, will create high-quality standards. In rock climbing, both muscle power and endurance training make up a successful climb. An accomplished climber can climb for extended periods of time without forgoing efficiency. That same level of endurance is needed for a successful climb to a stable, organization-wide energy efficiency program. Each company that hires an EDF Climate Corps fellow through Environmental Defense Fund is at a different point of its energy efficiency climb. I am currently completing my EDF Climate Corps fellowship at Cummins, an organization that is quite far along in implementing energy efficiency as part of its policies and forward-looking strategy. The participating companies of EPA’s Climate Leaders program formalized these efforts with a commitment to reduce 25 percent of the greenhouse gas emissions below 2005 levels by 2010.